(12 Noon GMT) -- Cruise passenger numbers for the UK and Ireland ocean cruise market have broken new records hitting an all-time-high of 1,789,000 passengers for 2015. The highest boost in eight years, UK and Ireland saw 145,000 more passengers take a cruise in 2015 than the previous year -- a nine percent increase, according to the Cruise Lines International Association (CLIA). And with the size of the market increased by two thirds (67 percent) since 2005, it represents the highest growth rate of all the major European countries. 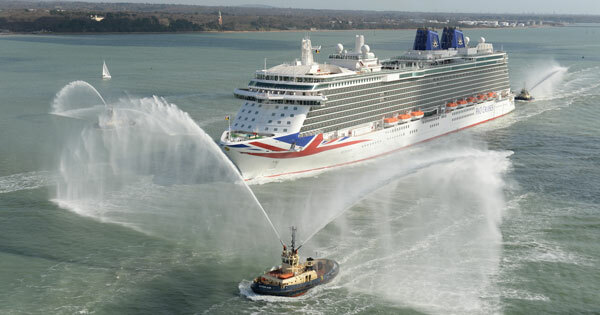 The market was boosted by big increases in capacity last year, with the launch of P&O Cruises’ Britannia (pictured above, arriving in Southampton), Royal Caribbean’s Anthem of the Seas and the return of Princess Cruises’ Royal Princess to Southampton. This year will see seven new ship launches including the biggest ship in the world -- Royal Caribbean’s Harmony of the Seas, which will make its debut in Southampton in May; and the return of Britannia to Southampton at the end of this month. The number of UK passengers starting their cruise at home rather than overseas also grew strongly in 2015 with UK cruise departures now accounting for 47 percent of the market (840,000 passengers in 2015). It was another successful year for British ports overall; in total more than one million UK and international passengers visited a British port during a cruise, a figure that has more than doubled in six years. An unprecedented uptick in the UK and Ireland river cruise market has also been recorded, with an eight percent increase in popularity bringing passenger numbers to 150,300 for 2015. Figures also show that cruising across Europe has reached a high watermark, with 6.6 million European passengers cruising in 2015 -- 200,000, or three percent more, than in 2014. CLIA UK and Ireland Director Andy Harmer said: "The increase in passenger figures bears testament to the diversity that cruising offers to today’s holidaymakers. The cruise industry’s continued confidence in the UK market is clearly demonstrated by an increasing number of ships that will sail from British ports in the coming years." Speaking at SeaTrade Global, which is currently taking place in Fort Lauderdale, Florida, Kerry Anastassiadis, CEO of Celestyal Cruises and member of CLIA Europe's Executive Committee, said: "The figures released today confirm the great shape of Europe’s cruise industry. Our opportunities to grow in Europe and elsewhere in the world have virtually no limits." Mediterranean cruises remained the most popular holiday choice for Brits, accounting for 672,000 passengers, while the Atlantic Islands (Canary Islands and Madeira) had their best ever year with a record 188,000 passengers. Meanwhile the Caribbean reclaimed more passengers after a three-year lull, experiencing an increase of 15 percent.